← What Are the Health Benefits of Drinking Enough Water? Even though we all know that drinking enough water is crucial to good health, it can still be difficult to consume the recommended daily amount. The first step to ensuring that you’re properly hydrated is determining exactly how much water you need to drink. According to The National Academies of Sciences, Engineering, and Medicine, a sufficient daily water intake seems to be about 3.7 liters (125 ounces) for men and 2.7 liters (91 ounces) for women. If you’re falling short of this goal and are looking for advice on how to drink more water, keep reading to learn some strategies that can help. Sometimes, the biggest obstacle to consuming enough water is that you don’t always have access to water that you like to drink. By setting up a water cooler in your home or business and having water jugs delivered each month, you can easily maintain a constant supply of great-tasting, purified water. Plus, your water cooler will provide you with chilled or hot water with the press of a button so that you can drink your water (or water-based beverage such as tea) exactly the way you want it. If you’re looking for ideas on how to drink more water when you’re away from your home or office, you should consider carrying a water bottle with you. Try to find a water bottle that looks nice and functions in a way that you like, since this will make you more apt to carry the water bottle around. When you have this water bottle with you while you’re out in the world, you’ll likely drink more water and will be less inclined to buy a soda or other sugary drink in the spur of the moment at a restaurant or store. When life gets busy, it’s easy to forget to drink enough water. One trick that can help is planning to drink water at set times throughout the day. You can decide to drink a glass of water when you wake up or whenever you sit down for a meal. You can also set alarms or reminders on your phone or computer to prompt you to drink water at any other points during the day. Would you like to drink a beverage that will hydrate you and have a tasty flavor? Try infusing your water with fruits and other ingredients. You can do this using a water pitcher in your refrigerator or a water bottle that you’ll take with you on the go. It works great with berries, mint, watermelon, and many other flavors – the possibilities are virtually endless! 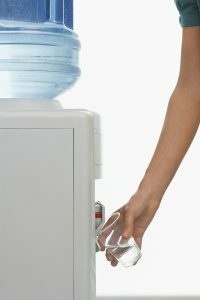 If you’d like to add a water cooler to your home or business, turn to Mountain Glacier. We serve a wide range of customers in New York, Texas, Tennessee, Kentucky, and Indiana, making it easy and affordable for people to maintain a constant supply of great-tasting water. If you’re been searching for ideas on how to drink more water, our water delivery plans provide the perfect solution. We’ll set you up with a quality water cooler and then return on a monthly basis to restock your supply of water jugs, disposable cups, and any other related items you require. Contact us today to discuss how we can meet your water delivery needs!